We are proud to have been elected as the first women mayors of Paris, Rosario, Bangangte and Barcelona. Yet, as women in local elected office, we know that we are still in a minority. A photograph of a city council meeting almost anywhere in the world will tell a similar story: a sea of suits and ties with female faces few and far between. The same is true at global level; the international summits of mayors we attend are overwhelmingly dominated by men. The importance of the gender gap in local political life should not be underestimated. First and foremost, this is a question of fairness and equality of opportunity. Women should have the same right to participate at every level of democracy as our male counterparts. If women are not being elected to local office in the same proportions as men, this is an injustice in and of itself. Our daughters must be taught, by example, that all paths are open to them. We have seen this role model effect in our own cities. Furthermore, we know that diversity has instrumental value. It has been proven time and again that diverse groups make better decisions. This is particularly true when it comes to a challenge as complex as governing a major city. Women’s experience of almost every aspect of urban life – transport, security, culture, the economy – is materially different from that of men. We need women, from a range of class, ethnic and religious backgrounds, to bring their unique experiences into local government so that these can be included and reflected in decision-making. Finally, the presence of women in local government has an impact on female political representation at other levels. Local government provides a pipeline of candidates for national office. In other words, closing the gender gap in parliaments and national executives will depend heavily on removing the bottleneck at local level. Fortunately, there is a growing recognition by the international community of the need to ensure women’s full and effective participation and equal opportunities for leadership at all levels. Indeed, this is a target of Sustainable Development Goal 5 of the 2030 Agenda, the set of 17 global goals adopted by UN Member States that came into force last year. SDG 5 represents a huge opportunity to put gender equality at the heart of development. What will come as a shock to many is that there is currently no global data on the proportion of women in local elected office. United Cities and Local Governments, the organization charged with representing local leaders on the global stage, estimates that just 20% of councilors and 5% of mayors worldwide are women. But these estimates are just that: educated guesswork based on experience. Knowledge is power. We can only achieve equality if we know where we are now and can measure our progress. Global indicators of women’s representation in local government will allow good practices to be identified and shared, and support to be targeted in places that are lagging behind. That’s why, on 13th March, women mayors from around the world will launch a campaign with UN Women, calling on the UN Statistical Commission to develop global indicators to track the proportion of elected women at local level. We want the UN to invest in monitoring tools to put gender equality at the heart of the development agenda. 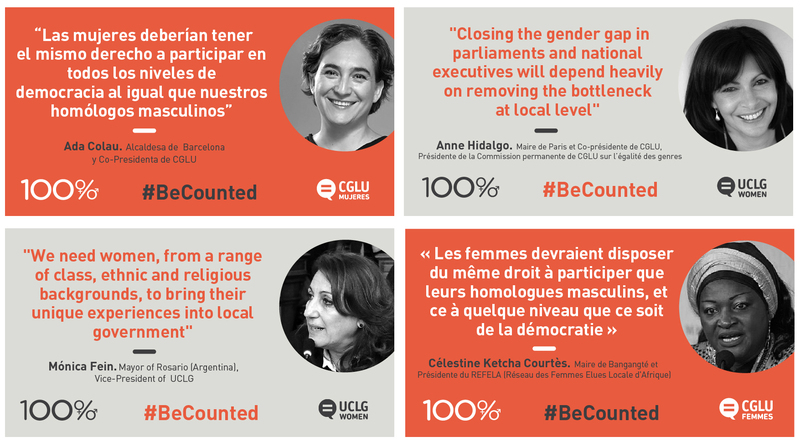 Women mayors are ready to stand up and #BeCounted. Now it’s time for the international community to count on us to help build a fair and sustainable future. Célestine Ketcha Courtès, Mayor of Bangangté and President of the The Network for Locally Elected Women of Africa (REFELA). No sustainable development without engendered local governance! Local governance key to achieving gender equality and social equity: Let’s make it happen!